Guy Whimper (born May 21, 1983) is a former American football offensive tackle. He was drafted in the fourth round (129th overall) of the 2006 NFL Draft by the New York Giants. Whimper played college football at East Carolina University. Whimper has also been a member of the Jacksonville Jaguars and Pittsburgh Steelers. He was waived by the New York Giants on September 4, 2010. Whimper was signed by the Jacksonville Jaguars on November 2, 2010. On October 28, 2012, Whimper was made an eligible receiver and successfully caught a pass for a touchdown against the Green Bay Packers. Whimper was released by the Jaguars on February 27, 2013. On May 6, 2013, Whimper was signed by the Pittsburgh Steelers. Whimper was seen as extremely unlikely to make the Steelers' roster, much less play, and much less than that play well. Due to an injury by tackle Marcus Gilbert and poor play by OT Mike Adams, Whimper played extensively against the Baltimore Ravens on October 20, and in the face of much skepticism, played well. 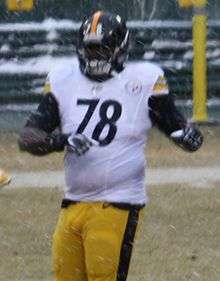 On March 17, 2014, the Steelers re-signed Whimper to a one-year contract. ↑ "Steelers Sign Whimper and Garvin". Retrieved August 22, 2016. ↑ "Kelvin Beachum and Guy Whimper Made Their Cases to Start". October 21, 2013. Retrieved August 22, 2016. ↑ "Pittsburgh Steelers Re-sign Guy Whimper; Prepare to Meet Lance Moore".